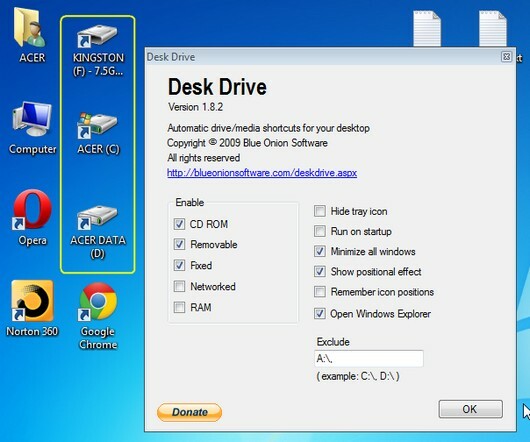 If you ever used Linux Distributions, you might have noticed that whenever you plug in a removable media like a USB Drive, CD/DVD a shortcut appears immediately on the desktop, where as in Windows you get an AutoPlay window from where you can the operation or an application that you want to use to open with.AutoRun feature in Windows OS is exploited for spreading virus across systems where the USB Drive is infected, which is what most network administrators disable AutoRun.Disabling the AutoRun deprives the users from a easy way to access the inserted media.Now the user needs to open up My Computer –> Removable Drive. Fixed Media ( ie., the Hard Drive Installed On Your Machine ) which shows shortcuts to the partitions on the desktop. If you have shared drives across a Network enabling the “ The Network ” option lets the app shows the shared drives on the desktop. The settings have various options for customizing its functionality. The tray icon can be hidden, to let the app run in the background.Use this once you set the options that you think fulfill you need.The change the settings after hiding the tray requires invoking the DeskDrive.exe from the application folder. AutoStart with Windows OS Startup, which makes it available with the need to manually start the application each time. Minimize All Windows, minimizes all the open windows to show the desktop where the new shortcut for the media is available. To locate the newly available drive shortcut icon, this options shows a effect highlighting the position of the icon. The drive is opened automatically in the Windows Explorer on insertion when the “ Open Windows Explorer “ is selected. If you want the icons to always be displayed at the same positions, use the Remember Icon Positions option. Drives can also be specifically excluded from showing up as desktop icons by excluding the Drive letters, in the Exclude box.For ex typing A:\,C:\ excludes Drives A And C from being shown as shortcuts icons on the desktop. Do share your thoughts on this app with us.